Why Wear the Brown Scapular of Our Lady of Mt. Carmel? We are happy to share the joyful news of the Reception of the Holy Habit of Mount Carmel by one of our postulants on February 5, 2003. 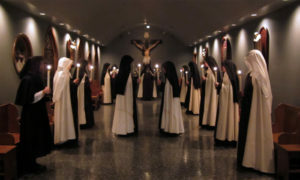 Clothing Day is always a most joyous day, a truly family day and, for the new Carmelite bride, a day of beginning in earnest the life of consecration to Our Lord Jesus Christ and His Church. Our new Sister joins us in praying for all our friends and benefactors, who so generously support our Carmel. And we ask you for your good prayers for Sister’s perseverance in this holy vocation. WHY WEAR THE BROWN SCAPULAR OF OUR LADY OF MOUNT CARMEL? In the year 1251, in the town of Aylesford in England, Our Lady appeared to St. Simon Stock, a Carmelite. She handed him a brown woolen scapular and said, “Whosoever dies wearing this scapular shall not suffer eternal fire.” The Blessed Virgin Mary also said, “Wear the scapular devoutly and perseveringly. It is my garment. To be clothed in it means you are continually thinking of me, and I in turn am always thinking of you and helping you to secure eternal life.” Is this not enough reason to immediately start wearing it? However, it is a sad fact that in our time the majority of Catholics have forgotten about or ignore the scapular. If you would like to learn more about the scapular, we now offer on our website a booklet called “Garment of Grace”. This little book tells stories of miracles granted through the Scapular, its history, the privileges attached to it, and it gives powerful and beautiful testimony of the saints about this precious sacramental. It also discusses the benefits that non-Catholics can derive from wearing her garment of grace. We recently took on a special project in honor of Our Lady of Mount Carmel. We designed a new Brown Scapular having all the traditional, time-honored symbols and message of this favored sacramental of Holy Mother Church. Searching the textile industry for a company to produce the washable woven labels was quite a challenge. But the company we found worked with us with interest and enthusiasm. In the end, several employees asked to receive a finished scapular from us, wanting to wear again what they remembered wearing as children. Our Blessed Mother finds many ways to make sure her children remain in (or return to) the Fold! Click here to see them or to obtain one.